Summer has officially unofficially started. Memorial Day has passed, and Independence Day is just around the corner. And if you’re a marketer, you’ve probably already started to plan your July 4th campaigns. And if you haven’t, you should. According to data from MailCharts, the first email for a July 4th campaign was sent out by Trip Advisor on April 20th. While It makes sense for travel and hospitality companies to get their messaging into customers’ inboxes far in advance, retailers should think about getting a head start as well. Independence day is a great opportunity for the retail and travel industries to tap into a festive crowd who are ready to spend money on the holiday. Shoppers spent $6.7 billion on Independence Day celebrations last year, and 33 million Americans made plans to travel. 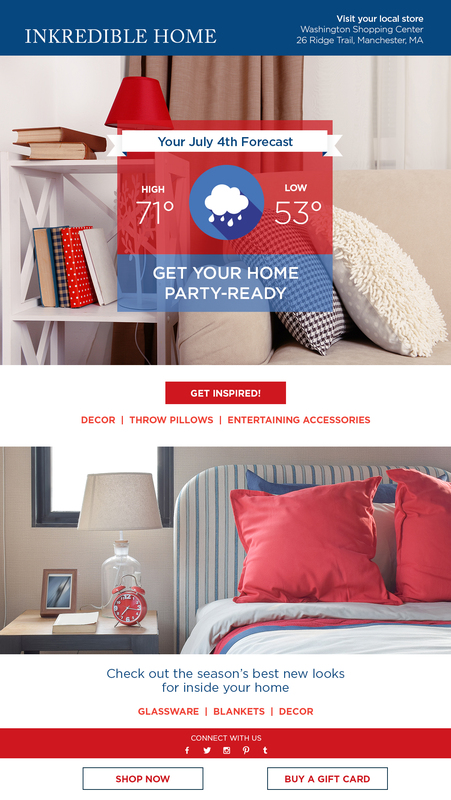 It’s not too late to create a great contextual email campaign for the Fourth. Here are four email campaign types to consider. Use a live countdown timer to create a sense of urgency around a promotion, then get them to your nearest brick and mortar with geo-targeted directions. 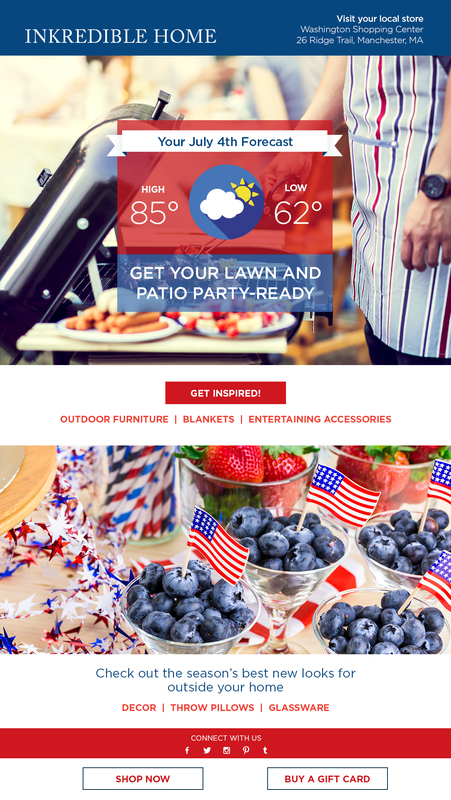 Offer up relevant products and offers based on the weather forecast for the Fourth. If it’s supposed to be bright and sunny at the recipient’s location, offer them outdoor products for a backyard BBQ or a picnic in the park. Is a rainy day predicted? Offer them ways to prepare for an indoor get-together. The more relevant your offer, the higher the sales. People love to give their two cents. Polls and other gamification elements increase engagement in emails, but they also allow you to collect data on consumer preferences and demographics. 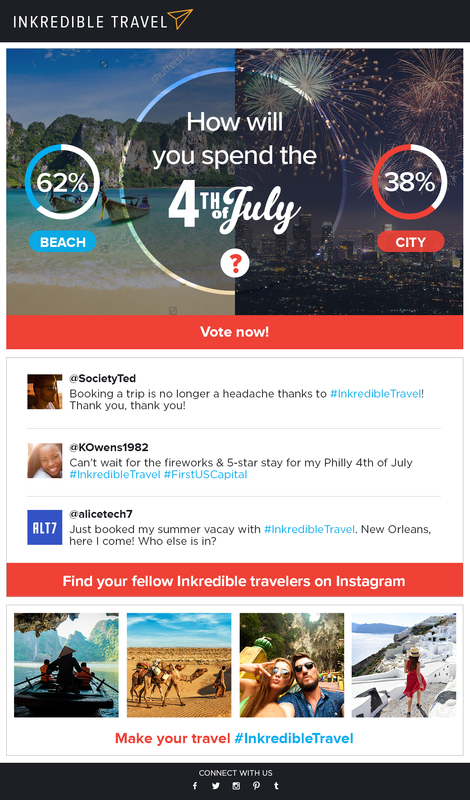 If you’re a travel and hospitality company, ask them where they’d rather be on the 4th of July. Then use that data to follow up with a targeted email. Using the preference data collected in a live poll, like the one above, you can send your customer offers that are even more relevant to their preferences. For more on July 4th email campaigns, watch our webinar How to Plan an Independence Day Email Campaign that Engages and Converts. This entry was posted in Email Marketing and tagged fourth of July, holiday email campaigns, Independence day, July 4th on June 1, 2016 by Amy Mullen.